Sleboda had the most liked content! I don't see the issue. We leave our ball (and bar) gags out. Visitors don't seem to mind. One even asked to try it. Well, first off, I don't use Wrathmongers. Second, our group really enjoys games with a good amount of terrain (looks so much better than 2 woods, 2 hills, 1 building that so many people seem to go with), and that makes it very hard to move them coherently. Third, in my games so far they are getting annihilated (meaning, dropped to under 20 and often down to 10 or fewer) before they contribute anything. Lastly, due to Blood Tithe, I'm starting to think small, disposable units are the way to go. Treat them like one-shot missiles that then die and give my bloodthirsters or skull crushers a bonus. I'm in pretty much your exact boat, though I've not used Skulltaker yet and I'm likely splitting up my bloodletter unit into 3 x 10 or 1 x 20 + 1 x 10. I'll be interested in reading how things go for you as you play more. Yes, many people are making that assumption, but it's still an assumption and not what the rules say at present. Take, for example, this as a comparison: Same heading of "Fly" and then a description of what that rule grants the model (and why, as it turns out). 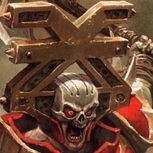 It would be kinda neat to have an undead faction led by a guy who swore allegiance to chaos and another one by a guy who gave the middle finger to chaos and now works for order. Kemmler of Chaos and Settra of Order both unwittingly working on the same 'side' in opposition to Nagash. Fer sher, and I pointed that out in my initial post on the topic. Imagining various ways to fly isn't really a problem or any sort. It's about them not indicating in the first part (description) what is on the model to give him the rule, and then realizing that the second part (the rule itself) is not actually the Fly rule, but a very specific Move increase instead. So, yes, imagine he is bounding on powerful legs. I'm with you. Why is that "justification" in the description to say he's blessed with fight, and then why are we (with the rules) allowed to make to leap to giving him access to rules he is not shown to have? Heck, I'm trying to make it work with three and having trouble. I am considering a demon prince like others, but I noticed something a bit odd. Normally when a warscroll is trying to add an optional ability that takes a modeling option into account, it will say something like "Some X are armed with poking sticks, while others are armed with hitting clubs" or "Some X ride horses into battle." The it tells you that if your model has this weapon or that, use the rule for that weapon, or if the model is on a horse, increase his Move, and so on. The demon prince just says some of them can fly and that the ones that can fly get extra Move. Two issues: 1) It doesn't tell you what makes a model able to fly. Yes, we can all look at wings and assume that makes it fly, but then again that's not a guarantee of the rule being in place. Besides, you could say he uses internal powers to make himself fly. You know, magic or whatever. Who am I to tell you you must show wings in order to fly, especially since there is no actual rule, either for the prince or in the game in general, that says wings=flying. 2) Even if we figure out the first bit, isn't it weird that the prince that can fly does not get the Fly rule, just extra Movement? It makes him still cool, but less useful than I was expecting. It's not like the game needed more help to make Objective play worse, but ... I think this combo, plus the Orruk one that does the same could make it fun to try to score the objectives that say 'hold them all.' It gets a lot easier when there are only 2 or 3 instead of 5. Just reading the Overlords now. Holy schnike! Their Fyreslayer cousins are going to jealous of that inspire condition. Plus, is this leader the first fighter to get +5 (so to speak) when inspired? Isn't it usually +3? I had the opposite reaction. The movement and range are very appealing, and I think they will reward skilled use of both. For some reason they have just a bit of a similar feel, or maybe just trigger a particular nerve for me, as the Thorns, which is my current favorite. I'm excited to get them. That's funny! 😀 (As in it's funny/neat/amusing to see how different opinions can be on the same thing.) In my opinion, the 6th edition book was the pinnacle of army book design. Nothing before or after it has been close. Cloak of the Dunes, Brooch if the Great Desert, the good version of the Destroyer of Eternities, the Hierarchy, the way carrion just worked ... Man, that army was fun, interesting, rewarding, and struck a perfect balance of power level. The hard cover you referenced was a failure in almost every possible way. The rules and background failed to connect in any meaningful way. Nothing worked well. Stalkers were better at killing themselves than the enemy. The ushabti with bows were junk. The coolest option in the book didn't even have a model. Sphinxes die to a stiff breeze. I could go on, but it really was a miserable failure by the designer. I think, while worth considering, that form of alternate activation would be too big a change and would require resetting all the rules. I'm certainly leaning toward adding the priest (and keeping the bloodsecrator), but why the second priest? @AresX8 Interesting list. A little heavy on mortal stuff for my taste, and also not a fan of the imposed lack of choice that the hosts bring, but I can totally see the appeal. If you had to go with less mortal influence, what would you do? As an experiment, if you had to limit your mortal points to 10% (200 of 2000) what would that look like?